Congratulations on the release! FeedDemon is definitely my favorite program. It’s the first thing I install when setting up a new computer. Thanks for all the hard work making FeedDemon the awesome program it is! Why is IE 7 required? I haven’t noticed any problems yet with IE 6. I have no problems with reading links via Opera 10 set as default. Thanks Nick, super nice upgrade. @jrstark: IE7 or later are required for several reasons, but chiefly because IE6 doesn’t support PNG alpha transparency and some CSS properties that FeedDemon relies upon. You can still use IE6, but the newspaper view may look jumbled at times, and icons in the newspaper may have an ugly gray background. 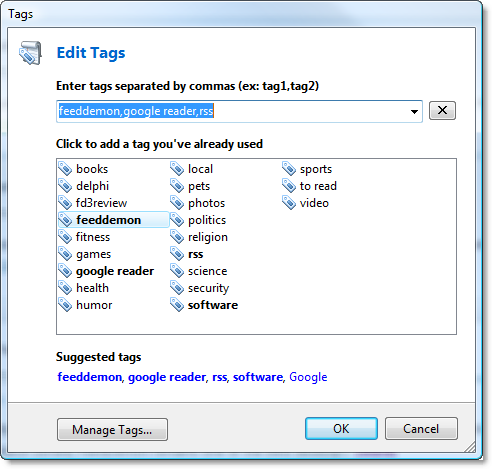 I registered FeedDemon in October 2004, but since the NewsGator services weren’t of any use to me, I moved on to Google Reader. 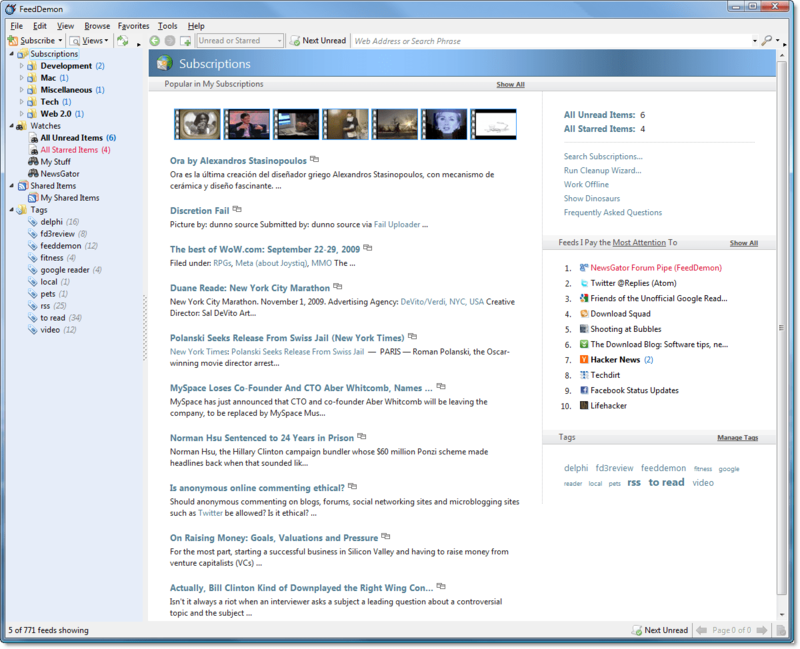 I have now downloaded version 3.0, since the integration with GR means I could read news on the desktop again, so great! My original registration key no longer works with this version, but that’s fine, I have no problem buying an upgrade every 5 years. Then I noticed FeedDemon has become ad-ware. Why is this significant change not mentioned prominently in your post, or at the FeedDemon overview page? In fact, it is not mentioned anywhere at all. This used to be more or less standard evil fare when adware was first invented. Today users expect full disclosure before they let adware touch their systems. Now, since NewsGator chose not to disclose the fact that FeedDemon is adware, what else is it not disclosing? Are the ads context-sensitive? Does FeedDemon “share” my subscriptions and/or the articles I read with NewsGator or with third parties? The license does not say it doesn’t, so it’s a fair assumption that it does. So imagine my surprise when I open FD and see the following under Subscriptions: Comics, Daily, Entertainment, Games, Gossip, Health and Fitness, Offbeat, Science and Sports. These are not my subscriptions, and I am not interested in what NewsGator thinks I should read. Why are these sections included after I specifically select “No, don’t subscribe me” during installation? If I now proceed to remove them manually, are they going to reappear when NewsGator decides I should _really_ be interested in that, or when I upgrade to a subsequent release? Nick, please forgive me this personal aside, but I just have to say it. Any project you have released – HomeSite, TopStyle, FeedDemon – was always the best in its class, hands down. As long as you actively maintained a project, nothing else, shareware or free, could touch it. I am a self-taught hobby programmer myself, and I can only wish I had your talent and your skills. But – and this is the part I ask you to forgive – I think with NewsGator you’ve lied down with the dogs. I would be happy to pay for the upgrade to get rid of the ads, but I cannot support NewsGator’s current policies. It’s just not done this way any more. In addition to the comment above: I have now seen that FeedDemon not only added the junk subscriptions I did not ask for, but polluted my Google Reader account with them as well. More manual work to remove them, thanks! And another question has just occurred to me: does FeedDemon share my Google Reader account username and password with NewsGator or any third parties? Putting my password in an application means trust. Please answer yes or no. Nick, wanted to tell you what a great piece of work FD 3.0 is. I’m back! Last year when FD began to evolve with ads I made a decision to stick with FD 2.7 and started looking for a suitable RSS reader replacement. 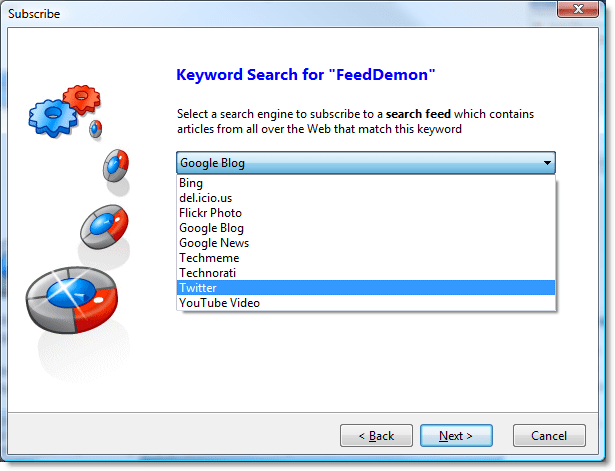 Recently, with the release of GoogleWave I started using my Twitter account more and in the process read on the web about FeedDemon 3.0 new features, and the ability to pay to get rid of the ads. I was lost for words, just thought time to give my favorite reader one more try. So, I couldn’t find a way to pay for it and just downloaded the free version. I wasn’t until after I downloaded the free version that I found a way to pay for the removal of ads. I had to come and say “Thanks!!! !” I have been with FD since the very early beta days and hated to walk away at version 2.7 because of the ads. But I’m back and I don’t know how you keep finding ways to improve FD? 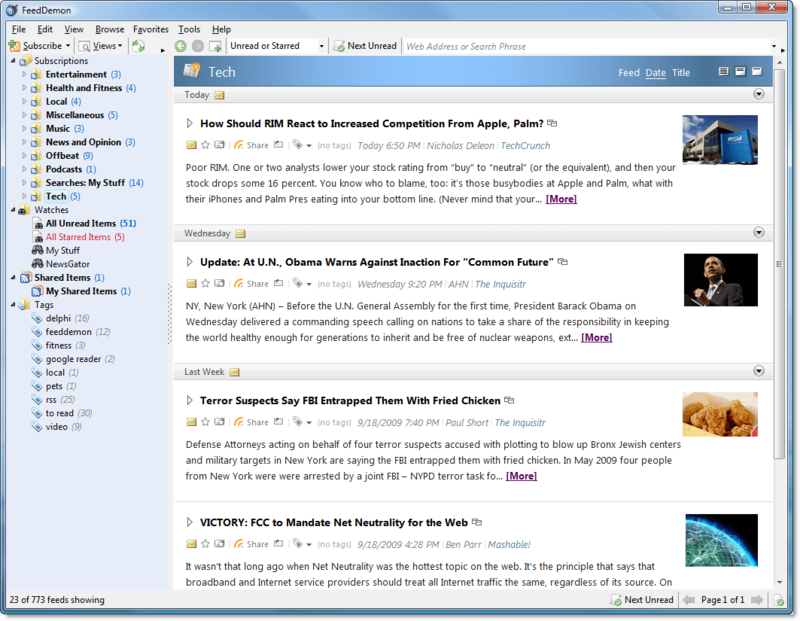 It is truly the best RSS reader, and I have tried all the ones considered the best, FeedDemon comes out on top easy. @marek: There was absolutely no attempt on our part to hide the fact that FeedDemon 3.0 has ads, as a quick search of this blog will prove. It has been mentioned here – and several other places – many times before, and it seemed pointless to bring it up again since my only goal with this post was to introduce the new features. FeedDemon doesn’t automatically subcribe you to those feeds unless you tell it to, and you explicitly have to click “Yes” for those feeds to be added (the default is “No”). I can only guess that those subscriptions were somehow left over from the previous version, or that you misread the step in the startup wizard which asked whether to subscribe you to anything. FeedDemon doesn’t share your subscriptions, nor does it share your Google login. Your login is stored locally, encrypted in the registry. It’s only sent to Google itself, and then only using secure HTTP. @abe: Thanks for giving the new version a chance – I’m glad you like it! FeedDemon 3.0 is a heroic effort Nick – congratulations! The combination of FD on the desktop and NetNewsWire on the iPhone combined with Google Reader sync is very powerful. Thank you for your perseverence and for the quality of your work. I have been quite critical of 3.0 and the ads in the past, but I installed 3.0 last week and it is very nice. I really do not like the ads and will be purchasing a license, but the improvements over 2.7 are very helpful. I even tried to cut out the middle-man and switch to Google Reader, but FD is still the best RSS reader around. Thanks Nick for a great piece of software. You continue to impress. I hope NG lets you retain control of this product and its future direction since you have a much better idea of where it needs to go than they do. I’ve recently installed FD3 and can only say…it’s great! $9.95 is peanuts to get rid of the ads, so I thank you for making your excellent software available at such a reasonable price. I’ve recently had to give up using HomeSite, but I still use TS3.5 (your version) which continues to give satisfaction. So it’s nice to be able to continue with FeedDemon as well. I particularly like the new UI and newspaper view. Also, FD3 seems to me to be faster than earlier versions. Am I imagining that? In any case, it’s nice! Also glad to see tagging, which is very helpful. I will try to use this feed in my future project, for now i will try to test this one.